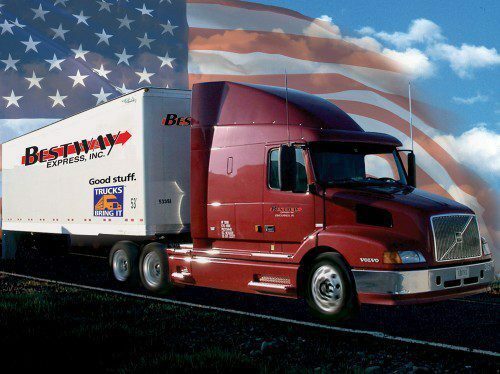 Bestway Express, Inc. drivers are paid weekly. Most of our routes have switched over to load based pay giving drivers the ability to earn more on shorter runs when the miles just aren’t adding up. Driver average pay ranges from $42,000.00 yearly for average drivers and $60,000.00 yearly for exceptional drivers that are willing to go the extra miles. Bestway Express, Inc. drivers are paid for trips completed from Sunday through Saturday, midnight. All paperwork is due in the Vincennes office before Tuesday at noon. All checks are mailed Wednesday. Direct deposits are all made on Wednesdays as well and should appear in bank accounts on Friday morning. If you have any issues associated with payroll, please contact your fleet manager. Bestway’s Safety and Operational Bonus can equal up to 2.5 cents per mile. This bonus is calculated by the qualified cents per mile earned in the month then multiplied by the number of miles ran in that corresponding month. The Safety and Operational Bonus is paid out monthly. Bestway’s Fuel Bonus can equal up to an additional 2.5 cents per mile. Like the Safety and Operations Bonus, the Fuel Bonus is calculated and paid out in an identical manner.